Those seven little words start Michael Pollan's essay, Unhappy Meals, in the New York Times magazine (from Sunday). As Pollan sums it up at the start, "That, more or less, is the short answer to the supposedly incredibly complicated and confusing question of what we humans should eat in order to be maximally healthy." Somehow as he meandered from his brillant assessment on the rise of "nutritionism" - "an ideology" - influencing nutrition - "the science" - he too fell for it; fell for the belief that animal protein is a dietary demon that must be limited, if not eliminated if we are to get back on track to reach an optimum diet, thus maximize our health. Intersperced throughout the essay are a number of not-too-subtle reminders that animal protein, especially meat, is taking up too much space on our plates. He continues to explain to us that the Gary Taubes article, What if it's All been a Big Fat Lie, was a "revisionist" accounting of what really happened in our diet since the implementation of the compromised dietary recommendations; cites T. Colin Campbell and Walter Willet as two researchers in agreement with the view that "the culprit nutrient in meat and dairy is the animal protein itself", thus we should eat less meat. He then ties it all neatly up with "But people worried about their health needn’t wait for scientists to settle this question before deciding that it might be wise to eat more plants and less meat. This is of course precisely what the McGovern committee was trying to tell us." We just heaped a bunch more carbs onto our plates, obscuring perhaps, but not replacing, the expanding chunk of animal protein squatting in the center. Of course thanks to the low-fat fad (inspired by the very same reductionist fat hypothesis), it is entirely possible to reduce your intake of saturated fat without significantly reducing your consumption of animal protein: just drink the low-fat milk and order the skinless chicken breast or the turkey bacon. Thomas Jefferson was on to something when he advised treating meat more as a flavoring than a food. Even the beginner student of nutritionism will immediately spot several flaws: the focus was on “fat,” rather than on any particular food, like meat or dairy. So women could comply simply by switching to lower-fat animal products. And then, in a plea to convince us to return to our ecological and cultural relationship with food and eating, and reduce our consumption of meat, Pollan suggests we "Eat more like the French. Or the Japanese. Or the Italians. Or the Greeks. Confounding factors aside, people who eat according to the rules of a traditional food culture are generally healthier than we are. Any traditional diet will do: if it weren’t a healthy diet, the people who follow it wouldn’t still be around. True, food cultures are embedded in societies and economies and ecologies, and some of them travel better than others: Inuit not so well as Italian. In borrowing from a food culture, pay attention to how a culture eats, as well as to what it eats... Let culture be your guide, not science." With all of this taken together then, it's difficult to wrap my head around his advice to "Eat more like the French. Or the Japanese. Or the Italians. Or the Greeks... Let culture be your guide, not science;" especially when he takes a huge leap of faith to explain the French Paradox by suggesting, "it may not be the dietary nutrients that keep the French healthy (lots of saturated fat and alcohol?!) so much as the dietary habits: small portions, no seconds or snacking, communal meals — and the serious pleasure taken in eating. (Worrying about diet can’t possibly be good for you.)" So while I agree with his recommendations to eat real food (not processed, packaged, unknown generations ago foodstuff) and not too much, I'm baffled by his indictment of animal foods and his strong words against eating meat - especially when he then holds up four countries as somehow traditionally superior to our own because their dietary pattern is real food, not too much and mostly plant-based food. The problem with that is the data doesn't align with the dogma which holds the traditional dietary patterns in Japan and the Mediterranean are plant-based, rich with "good fats," and naturally limits consumption of meat and animal foods. Gosh, maybe staying thin and smoking makes you live longer? No, I don't think that's what Pollan was thinking when he suggested we eat like any of the above countries! No, the implication is they consume a healthier diet - specifically with more plant foods and less animal protein and animal fat. The big question is, do they? Of all the countries, we actually eat the least amount of protein as a percentage of calories with 12.2% of our total calories provided by protein. Italy consumes 12.4% of their calories from protein; Greece 12.7%; France 12.9%; and Japan 13.2%. But wait, percentage of calories is often misleading since it doesn't tell us the absolute gram intake and if they're eating less calories than we are, then even with higher percentage of protein, they're likely eating less protein....right? Wait, wait, wait - that's total protein! What about animal protein? Surely if these countries consume plant-based diets, the majority of their protein will be from plant-based sources and little will come from animal foods, right? So, from our country to each Pollan asserts has a better dietary pattern, we find adequate intake of protein and a majority of that protein is from animal foods. Something then is making us fatter than them - could it really be that we're eating too much fat? OK, so with the exception of Japan, these countries consume a "high fat" diet, not the mythical "low-fat" diet we're told they eat. Perhaps then, the problem with our diet goes a bit deeper - maybe it really is the animal fats, the "bad" saturated fats we're told we should limit and avoid if possible. Surely death from heart disease must be highly correlated with their protein or fat consumption? It has to be there somewhere - we're told repeatedly if we eat too much animal foods we're going to increase our risk for heart disease! So, again, what does the data say? So it seems if we're looking to reduce the risk of heart disease, it's an all-or-nothing proposition when it comes to protein and fat - France and Japan are very similar for rates of death from heart disease, but their diets are radically different; France consumes a high fat, high saturated fat diet, rich with protein and animal protein; Japan consumes a lower fat diet, lower in saturated fat, but still 40% of their fat calories from animal source, and their diet is rich with protein and animal protein as a percentage of their calories. Hey, let's add to the confusion - both countries also have the highest percentage of the population that smokes - in France 27% smoke, in Japan 30.3% smoke! So is the best advice to take up smoking and eat eather a low-fat with less than 30% total fat or eat a high-fat diet withmore than 40% of calories from fat and eat lots of animal protein while you're at it? No, but unlike Pollan's subtle and not-so-subtle implication that the diets he suggests we follow do not include much meat or animal protein, the data clearly shows that protein is an essential part of these diets; the Japanese consume 57% of their total protein from animal protein sources, the French consume 65% of their total protein from animal protein sources. Surely something is protecting these populations for heart disease; surely it's something we or they eat or do that the other doesn't. What can start to explain how these countries eat better, live longer and die less from heart disease? It's not the fat, it's not the protein, it's not the animal fat and it's not the animal protein. Heck, it's not even their smoking or drinking habits. I don't know - but the one glaring difference in our diets isn't our protein or fat - it's our consumption of sugar. As a nation, we consume almost twice as much added sugars - 657-calories a day, 17.5% of total calories - than the next closest country, France (383-calories/day 10.5% of calories). Our sugar consumption is significantly higher than all the countries - Italy 302-calories/day 8.2% of calories; Greece 332-calories/day 9% of calories; Japan 271-caloires/day 9.8% of calories. Pollan got sucked into the dogmatic belief that meat is the problem in our diet because he didn't do his homework - he accepted the version of the "healthy diet" as espoused by those trying, desperately, to convince us to eat less meat and animal foods and adopt a plant-based diet; accepted a "healthy diet" means eating less meat and animal foods. Problem is, the data tells us something different - it tells us the real, tangible, measurable difference between us and them is our consumption of added sugars. Eat real food, not too much, limit the added sugars! An email this morning provided a link to a recently published paper at the Göteborg University Library, Nutrition and health in 4-year-olds in a Swedish well-educated urban community. It is the dissertation of PhD candidate Malin H. Garemo, designed to "analyze nutrition in healthy 4-year-olds´ in a Western urban community in Sweden in relation to socio-economy, life style and different aspects of health in order to improve the understanding of possible associations." From the abstract, we learn the children were also deficient for essential nutrients, vitmain D, omega-3 fatty acids and iron; we also learn that "higher BMI was associated with lower fat and higher sucrose intake;" and these children were not consuming more calories than required for their energy needs. Even more alarming in the findings, "girls had significantly higher metabolic markers than the boys. In girls, the HOMA ß-cell function was negatively associated with the intake of fat and positively with the intake of carbohydrates." Folks, these were four-year-olds - not teens, not adults - but very young children! The summary says it all "A lower fat intake was associated with higher BMI and higher HOMA ß-cell function. fS-insulin and insulin resistance were associated to increased growth rate from birth to the age of 4 (upward centile crossing). Risk factors for the metabolic syndrome can be identified already in healthy 4-year olds, especially in girls." When children are found deficient in vitamin D, the first things that comes to mind is the diet; it may be lacking enough eggs, butter, cream, fish, liver and/or whole milk and dairy foods like yogurt. That, and depending upon the time of the year, inadequate exposure to sunlight. When children are found deficient in n-3 fatty acids, the first things that come to mind is the diet may be lacking enough eggs, alpine cheese, fish, oil-packed fish, nuts, but butters/oils and vegetables like squash. And when children are deficient in iron, the first things that come to mind is the diet may be lacking enough eggs, green vegetables, meats, liver, and.or beans. In this review, the children were lacking all three of the above and lower fat intake was inversely associated with higher BMI too. If we review these major deficiencies in the diet of these children, and consider the conclusion they need more dietary fat and less carbohydrates (specifically sugar), it's easier to understand the importance dietary fats have in growth and development for children. Their little bodies are akin to perpetual energy, and constantly needing a much higher level of calories than just looking at them would suggest. Honestly, who would think a little 3-or-4-foot kid would need as much as 1,500-calories a day? That's because they're constantly in a state of growth - whether it be physically growing taller, physically laying down muscle or fat stores, or internally growing nerves or blood vessels - they're always growing something, and that requires not only calories for energy, but specific building blocks to make it happen properly - vitamins, minerals, trace elements, amino acids, and fatty acids. In previous generations the focus was mainly on getting and providing enough food to meet these energy needs; today we've modified our view and extrapolated our notions about a "healthy diet" - carbohydrate-rich, low-fat - to our children. Not a day goes by that there isn't an article or segment in the news that we need to feed our kids less fat and more "good" carbohydrates. But, as this study found - lower fat, calorie compensated with more carbohydrates; that is an energy balanced diet - is inadequate for essential nutrients and is leading to profound metabolic consequences, especially in girls. The changes noted for girls are those that lead to PCOS, infertility, diabetes and a host of other health ailments later in life including cardiovascular disease and some cancer. But Im pretty darn sure we're going to continue to read and hear we need to cut fat out of our children's diets and feed them more carbohydrate; afterall, a proper diet is plant-based, low-fat, with limited artery-clogging animal-based foods. 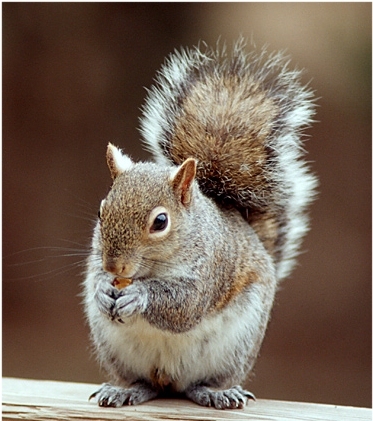 Officals in New Jersey are advising residents in Ringwood not to eat the squirrels; or at least limit consumption! Oh dear....it seems the little critters are contaiminated with lead. In today's Telegraph an article asks - what can be done to tackle the obesity epidemic? An "alarming" obesity epidemic is condemning an entire generation of British children now at primary school to increased rates of serious health problems, a committee of MPs has warned. The report criticised the Government for doing little to curb the problem, which already costs Britain £3.5 billion, and argued that schools should tell parents when their children are overweight or obese. What do you think can be done to tackle Britain's obesity epidemic? Who or what is to blame? Should parents be taken to task if their offspring are overweight? Or would that risk stigmatising the children in question? If you have children, how do you encourage them to be fit and healthy? Why do you think British - and American - children are generally more prone to obesity than their European peers? Not a day goes by in the US that we're not reminded, by the media and policy makers, that childhood obesity is rampant, our children at risk for a host of ailments in their future if we do nothing to stop this crisis, and they may even have a shorter life expectacny if we don't do something to reverse the trend. Go to any mall, playground, school, or other place children are and it's obvious that many more children are overweight than in previous generations; where previously one or two might have stood out in a crowd as heavier than the others; today it seems the thin children stand out from the crowd. Simple observation tells us that there are more children who are overweight today than in years past. One question asked in the above article, "If you have children, how do you encourage them to be fit and healthy?" provides me an opportunity to share my strategies. We often hear that children, especially toddlers and pre-schoolers, are picky eaters. While that may be true, that doesn't mean we should feed them anything just to get them to eat something. Often I see parents offer really great options only to cave in to whining for something else; it's easier to give the child what they want because it's often uncomfortable to think we're making our child(ren) unhappy or distresed; so the french fries or chicken nuggets are rationalized as acceptable because at least the child is eating something and is happy. Then some parents seem to go out of their way to provide whatever the something else is; at a recent holiday party we attended, a mom I know actually brought McDonald's for her children because that's what they wanted; never mind the incredible spread provided by the hostess, the kids wanted burgers and fries, what can you do? Needless to say, thus far, my stategy to provide quality food, the majority prepared at home, is working. If my son doesn't want to eat something offered, that's okay; if something else is readily available as a choice, he's can have that to eat if he'd like. What he isn't given is the opportunity to whine his way to junk foods or a separate meal prepared just for him; our family meals offer enough variety that we'll each find things we like - if we don't like something, no biggie, don't eat it, pick something from what else is prepared. My husband and I do take an "all bets are off" attitude when we're eating outside our home, where our son is likely to be offered foods we don't typically have at home. We've been pleasantly surprised that the habits he's developed at home continue (on his own) when he's allowed to choose and eat whatever he wants from what's being served. A quick story that illustrates what I'm talking about. We recently visited family and he had an incredible time with his cousins. Dinner was an delicious spread of Middle-eastern foods along with a pot of blue-box macaroni and cheese prepared for the kids since the food was spicy. Plated for him, by his aunt, was the mac & cheese, some vegetables, and the lamb and chicken. What did he eat? The chicken, lamb and vegetables. He did take a bite of the mac & cheese, chewed it a bit and then asked to spit it out, he didn't like it. I wasn't surprised, he doesn't like pasta. I chalk his dislike of pasta up to it being pastey and bland compared with what he normally eats. So what does he normally eat? Instead of just telling you his menu, let me show you his typical day of eating - the foods prepared for him on an average day at home. Let me also say he's in the 95th percentile for height; 50th percentile for weight; and 20th percentile for weight-to-height ratio. Oh, and he doesn't eat off the china - I've plated the food before serving it to him on regular plates for the picture taking, so the foods aren't lost in the patterns on the plastic plates for kids! Breakfast - broccoli and cheese omelet; yougurt with blueberries and strawberries. What he actually ate - the yogurt and berries and about half the omelet, picking out all the broccoli to eat it; he also had some whole milk. What he actually ate - about 2/3 of the burger, all the spinach, most of the grapes; he also had some whole milk and cod liver oil. What he actually ate - the chicken, kiwi, most of the string beans and carrots, whatever rice stuck to his chicken, tomatoes and ranch; he also had some whole milk. What he actually ate - apple with skin removed, cashews, three of the raisins, and he used the pita triangles as a means to scoop up the hummus, ate one bite from the pita and left the rest; he also had some juice heavily diluted with water. I've had some criticize his eating, suggesting that he's being deprived of nutrients because he's not eating enough grains or starches. If this is your first reaction to his day of eating, you can relax - after accounting for what he actually ate, his day provided every last vitamin, mineral, trace element, amino acid and fatty acid he needs. In this day he ate about 1265-calories; of which 63g was protein. His typical day of eating provides all essential micronutrients; yet it does not conform to the dietary recommendations that insist specific macronutrient ratios - 55% carbohydrate, 15% protein, 30% fat - as necessary to meet nutritional requirements; that encourage copious consumption of grain products; that suggest reducing fat after two is critical to avoid chronic disease later in life; and that minimize the effect of added sugar in the diet. We're often told that if we'd only feed our children according to the recommendations and encouraged more phyiscial activity, we'd not see obesity in children. What the experts fail to consider is this - the diet they're recommending is short-circuiting our children's natural satiety signals because it is challenging the metabolic pathways and failing to meet all nutrient requirements beyond the macronutrient level (carbs, protein, fat) to the micronutrient level (essential fatty acids, amino acids, vitamins, minerals and trace elements). Children have much smaller stomachs than adults, thus can't eat nearly the same volume as adults, yet require more calories per pound because of energy expenditure and growth. Their diet needs to be energy-dense and nutrient-dense in less volume than an adult. So what are we told to feed them once they turn two? We're specifically told to eliminate or strictly limit the nutrient-dense, calorie-dense foods and feed them more foods that are low in fat to keep dietary fat and cholesterol within limits; provide them a diet rich with carbohydrates from grains, cereals, sugar, fruits and vegetables; limit meats to those that are lean; switch to low-fat/skim dairy products or dairy replacements like soy milk; and be mindful to include snacks and variety in the diet. While I commend whomever designed this menu for using only whole foods, with no packaged snacks, I cannot find much else to praise; namely because, while it provides adequate amino acids, the menu fails to provide adequate intake of Vitamin E, Vitamin K, Copper, Selenium, Potassium and omega-3 fatty acids. While it provides a similar amount of protein (60g) as what I prepared for my son (63g), and doesn't contain much added sugars, it does pack a potential punch to blood sugars and insulin with 154g of carbohydrate and less fiber (10g versus 15g). Add to this, that even though volume weight is virturally identical to the diet consumed by my son (1367g versus 1368g), it provides 100 more calories than his; if the higher amounts of food suggested as snacks are included, it could provide 400 calories more. The recommended diet offers more calories, a high level of carbohydrate to be metabolized as glucose in the body, less fiber and inadequate levels of many essential nutrients. Why are we making recommendations that are nutritionally inadequate and a metabolic challenge? We seriously need to start re-thinking our dietary recommendations for children; right now our dietary recommendations and policy are failing them because our phobias about dietary fats have seeped into their lives as we've modified their diet to limit fat and include an abundance of carbohydrate-rich foods that does not, at the end of the day, have the desired effect. Our children are gaining weight because the diet we're recommending they eat is higher in calories without providing all essential nutrients (even with all the fortification of foods) and is a burden on their metabolism. As a parent I can only do what I believe is best for my child; and when it comes to food, the best for my child is a nutrient-dense diet that targets essential nutrients, not a specific ratio of carbohydrate, protein and fat; nor a specific number of servings of grains, beans, meats/fish/poultry, milk, fruits, nuts, seeds or vegetables each day. As a member of a larger community, I can only share my experience and results. It seems the folks at PETA have no limits to which they'll go to promote a vegan diet to the population at large. 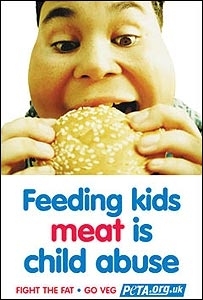 Their latest propoganda - the above poster "advertisement" in Britian - which says that feeding children meat is child abuse. As reported by the BBC, even with 67 complaints about the poster, directed to the Advertising Standards Authority (ASA), the advertisement is allowed to remain prominently displayed throughout the country. The ASA did not feel the poster trivialized child abuse, was misleading, or had the potential to harm children if parents removed meat from their child's diet. In their defense, PETA argued that "[i]t believed it was acceptable to say giving youngsters food that some scientific research stated was more harmful than a vegetarian diet was "tantamount to abuse." What happens when you mix a national retailer with advice to lose weight? You wind up with the latest and greatest marketing campaign to sell goods to consumers through a program encouraging you to "Get Fit. Get Rewards." for signing up to lose weight with KMart's website, New Day Your Way. The lead-in page is convincing! Heck, if you sign-up you can get coupons to go shopping and buy products sold by KMart! Yippie! What exactly is the weight loss program they're providing online? Well, over at the site's "Food School" we find an area sponsored by the American Diabetes Association and an At-a-Glance Food Guide with the following recommendations for women: Protein 45g; Carbohydrate 55% of calories; Fat 30% of calories. If fat and carbohydrate make up 85% of the total calories, and 45g of protein is the remaining 15% of calories, they're endorsing and recommending a 1225-calorie a day diet for women without actually saying it. Let's be honest here, for the vast majority of overweight women trying to lose weight, this is simply not enough calories to meet basal metabolic requirements - the energy needed for basic functions like heart beat, body temperature and blood flow. For example, a 30-year old woman, 5'6" tall, weighing 175-lbs (BMI 28.2), requires a minimum of 1578-calories each day to meet basal metabolic energy requirements. If she weighs more, she requires more calories just to meet basic needs. Putting aside the calorie recommendation, more disturbing is the recommended intake for vitamins, minerals and trace elements - those provided will lead to significant nutrient deficiency if followed. With just 45g of protein each day, a woman who might weigh 175-lbs is also going to fail to meet minimum requirements for amino acids; protein requirements are agreed to be 0.8g/kg of body weight - at 175-lbs a woman would require a minimum of 64g of complete protein to meet her minimum needs each day. Now, imagine this - a young woman, overweight at 175-lbs, following the advice to consume just 150mcg of folate each day who then gets pregnant. Can you say high risk of neural tube defects? Higher risk of anemia? Imagine now she's also followed the advice to consume just 500mg of calcium each day, just 2.5mcg of vitamin D, and just 200mg of magnesium. Can you say high risk of bone fracture? In both of the above examples, the site recommends micronutrient intake far below the Daily Recommended Intake (DRI) published by the National Academy of Sciences, Institutes of Medicine. In fact, the site's recommendation for Folate is just 37.5% of the DRI - the IOM recommends women consume at least 400mcg each day of folate! The site recommends intake for sixteen different micronutrients - vitamin A, thiamin, riboflavin, niacin, patheotenic acid, vitamin B-6, vitamin B-12, vitamin C, vitamin E, vitamin K, vitamin D, folate, calcium, iron, magnesium and zinc. Of these, six are accurate (based on the IOM's established standards); eleven fail to meet DRI, and even the lower Estimated Average Requirement (EAR); and one, vitamin A, actually exceeds the upper tolerable limit established by the IOM. So not only will your average overweight woman be eating too few calories, she'll also be consuming a diet that's nutritionally bankrupt. All brought to you by the American Diabetes Association and KMart. But hey, you can get some coupons to go shopping! Do you Know What's in your Child's Salad Dressing at School? Students at Plum Senior High School, in Pennsylvania, weren't told their school was a test site for z-Trim, an alternative fat developed by the USDA; licensed for sale to FiberGel Technologies. As the Pittsburgh-Tribune reported, "[t]he district has used the product for 10 months, but the students weren't told that until yesterday." As a parent, I find this disconcerting - children being used as test subjects without consent; fed a man-made grain-based ingredient in food without their knowledge; in a taxpayer funded public school district, no less! What other things are our kids used a lab rats for in schools today? This morning a press release from Marriott caught my attention, Kids Eat Free - Three Meals a Day - At Marriott Hotels, as it reminded me that the topic of the "kid's menu" is one I've kept putting off writing about since there are so many other things to write about that always seem more pressing. Since my son was born, my husband and I have almost always taken him out to eat with us. It's very rare he doesn't accompany us. 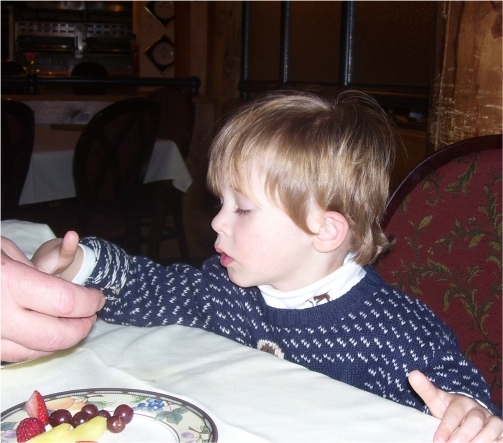 I can still recall one of our first dinners out when he was finally predictably and regularly eating solid food, he was 10 or 11-months old - we ate at Lebanese Taverna in Arlington, VA. Seated at the next table was another couple with their little girl, who was probably 2, and a delight - well behaved, laughing happily as her parents engaged her and enjoyed their dinner. What struck me as somehow sad was her meal - deep-fried, breaded chicken fingers with french fries. Here her parents had an incredible opportunity to provide a wonderful and delicious new taste experience for her, and they instead chose to order the same-old, same-old, available on every kid's menu in America - chicken nuggets and french fries. That night, my son dined on tastes of everything we were eating - Hummus bel Shawarma, Mixed Shawarma and Sharhat Ghanam. Portion sizes being what they are these days, it was more than enough for the three of us, with leftovers taken home in a doggie-bag! In almost every restaurant we're eaten in, it's the same story - the kid's menu is often a repeat from the last restaurant - chicken nuggets, noodles with butter (and sometimes even cheese), pizza or bugers (with and without cheese) - with a side of french fries or other potato concoction (think tater tots), a beverage and often a dessert too; all for a rock-bottom price that's hard to pass up! Is it any wonder our children's most often eaten foods are fries, pizza, burgers, pasta and chicken nuggets? It's all we offer them each and every time we order off the kid's menu! On our recent vacation in Colorado, we had lunch at Alpenglow Stube (young children are discouraged from the dinner hour). This gave us an opportunity to bring him up to the summit on a gondola, and as luck would have it, a snow cat ride down the mountain after lunch since the winds picked up and the gondola was closed due to high winds. Lunch is a pre-fixe menu that included a starter buffet wtih a sampling of cheese, crackers, breads and spreads from around the world, followed by a choice of homemade soup, then a second buffet of salads, fruits, and other selections before the entree was finally served. On the day we were there our soup selections were either coconut-chicken-curry or wild boar sausage in a tomato and vegetable base; our entree selections were rack of lamb or a surf-and-turf combo of grilled venison and shrimp. Some pretty daring stuff to consider for a toddler! As we read the menu and options, we were told our son might prefer noodles with butter, an item not listed on the menu; then it was added, we could also choose off the menu if we preferred, assured that portion sizes were small anyway. No decision really - our son hasn't had a meal off a kid's menu in a restaurant - so it was the wild boar soup for him and me (coconut-chicken-curry for my husband) and grilled venison and shrimp for him; rack of lamb for both my husband and me. A quick trip to the cheese buffet started our delicious lunch with feta, goat, blue, cheddar and brie, a small assortment of crackers and some unidentified (but interesting looking) spreads. The only cheese not eaten by my son - the blue, which was quite tangy, with quite a "bite" to it; understandable that a two-year-old might not find it palatable! Our soup, a small and reasonable portion, followed. It too was delicious, only the broth a touch too spicy for our son - so he picked out the vegetables and sausage to eat, leaving the broth behind. This was followed by another quick trip up to graze the salads - some tomatoes-basil-mozzerella, olives, sliced melons, grapes, strawberries and pineapple proved to be winners. The entrees followed, beautifully presented, equally delicious - and as stated, portions served as portions should be - just enough to enjoy without the need for a wheelbarrow to carry out the leftovers! Dessert, nah! - we were quite content after this feast, nibbling on the last bits of fruit and cheese, and passed on the delicious sounding desserts offered; awaiting our small doggie-bag (a leak-proof box actually) to arrive with our bill. My reason for these details? No other child in the restaurant that afternoon was eating anything other than the bowl of noodles and cheese, a bowl that contained no less than six cups of pasta, I'm telling you, it was HUGE, glimmering with butter and parmesan cheese. Every child under five, it seemed, was left to mull over this super-size bowl of noodles while their parents enjoyed the incredible meal. Surely with the cheeses, fruits, salads, speads and entrees (that included a wonderful assortment of baby vegetables as the side) these kids would find something they liked and would eat, no? In this restaurant, it wasn't a matter of enticing rock-bottom price - whether we chose the noodles or the complete menu, the price was the same. So, why would anyone not choose the full-menu and encourage their children to at least try this wide assortment of well-prepared, fresh, delicious food? Somehow I think we've come to believe our children will not eat such food; they're picky eaters and prefer the known over the unknown. In some ways this is true; moreso if you do not encourage a wide variety of flavors, tastes and textures early on. The "kid's menu", I believe, reinforces the notion that children will only eat a very limited selection of foods. Can you imagine, that no matter where you go to eat out - italian, chinese, mexican, indian, american, steakhouse, seafood, thai, french, lebanese, middle eastern, or other yummy sounding restaurant - you're given just four choices, actually the same four choices, every time you eat out? Chicken nuggets, burgers, noodles, pizza - again and again, everywhere you go, every restaurant you're taken to eat. Is it any wonder our children's most often eaten foods are fries, pizza, burgers, pasta and chicken nuggets? We're teaching them that's what you eat, what they're to eat, every time we eat out and once again order something for them from the "kid's menu." Personally, I don't see us ever ordering off the kid's menu - thus far, this decision has served us well; our son enjoys eating out, is continuously trying new foods, and we've yet to not find something on the menu we're going to order that isn't something he'll eat too. Over the holidays, we dined at a local steakhouse with visiting family - an extra side of aspargus (cooked tender) was added to our order simply because it's one of our son's favorites and didn't come with any of the entrees. His plate was filled with a selection of our meal, along with his asparagus and some of our vegetables. The kid's menu at that restaurant? Burgers, chicken nuggets or pizza. No bowl of noodles, but I bet if we'd asked, they would have made them! Childhood obesity is on the rise and I have to wonder if, with all the meals eaten away from home these days, if part of the problem isn't so much the eating out part, but the never-changing, always the same meals - the same junk food everywhere and anywhere you eat out - encouraged by almost every restaurant in America, found again and again the kid's menu? While these items may appeal to the budget, what are they really teaching our children about eating? Last month I took quite a beating in email when I posted Big Brother Takes Job as Short-Order Cook. In it I questioned what restaurantuers would replace industrial trans-fats with, and provided a short list of contenders being promoted in the marketplace. I also said "I'd bet that this government-enforced decline in trans fat consumption in restaurants will be matched by something as just as bad, if not worse (considering our apriori obsession with total dietary fats and condemnation of dietary saturated fat), although we'll feel good that we're not allowing any appreciable trans-fats to be served to anyone eating in a New York this time around, and we'll continue to be ever-vigilant about those dreaded saturated fats because we can be sure the watchdogs will be out in force to make sure no one uses them to replace partially hydrogenated fat in food preparation!" On things like this, I hate being right. Just released yesterday: New fat, same old problem with an added twist? Waltham, MA -- Last month, New York City outlawed the use of partially hydrogenated oils, known as trans fats, in restaurants, a ban now under consideration in other cities, including Boston and Chicago. But novel research conducted in Malaysia and at Brandeis University shows that a new method of modifying fat in commercial products to replace unhealthy trans fats raises blood glucose and depresses insulin in humans, common precursors to diabetes. Furthermore, like trans fat, it still adversely depressed the beneficial HDL-cholesterol. Published online in Nutrition and Metabolism (http://www.nutritionandmetabolism.com/), the study demonstrates that an interesterified fat--(a modified fat that includes hydrogenation followed by rearrangements of fats molecules by the process called interesterification) enriched with saturated stearic acid--adversely affected human metabolism of lipoproteins and glucose, compared to an unmodified, natural saturated fat. Interesterification to generate a stearic acid-rich fat is fast becoming the method of choice to modify fats in foods that require a longer shelf life because this process hardens fat similar to oils containing trans-fatty acids. The new study shows that interesterification, which unnaturally rearranges the position of individual fatty acids on the fat molecule, can alter metabolism in humans. "One of the most interesting aspects of these findings is the implication that our time-honored focus on fat saturation may tell only part of the story," explained biologist and nutritionist K.C. Hayes, who collaborated on the research with Dr. Kalyana Sundram, nutrition director for palm oil research at the Malaysian Palm Oil Board in Kuala Lampur. "Now it appears that the actual structure of the individual fat molecule is critical, that is, the specific location of individual fatty acids, particularly saturated fatty acids, on the glycerol molecule as consumed seems to make a difference on downstream metabolism of fat and glucose," said Hayes. Both Hayes and Sundram are experts on human lipid metabolism and were instrumental in the development of Smart Balance® Buttery Spreads, a blend of vegetable oils that improves the cholesterol ratio. Trans-fatty acids, which became ubiquitous in baked goods, processed foods and restaurant cooking decades ago because of their shelf life and other properties, are now being abandoned by many producers of commercial products such as cookies, crackers, pies, doughnuts, and French fries because they raise LDL ("bad") cholesterol, lower HDL ("good") cholesterol and contribute to heart disease. The Malaysian-Brandeis collaboration compared trans-rich and interesterified fats with an unmodified saturated fat, palm olein, for their relative impact on blood lipids and plasma glucose. Thirty human volunteers participated in the study, which strictly controlled total fat and fatty acid composition in the subjects' diet. Each subject consumed all three diets in random rotation during four-week diet periods. This study further confirmed previous studies in animals and humans, indicating once again that trans fats negatively affect LDL and HDL cholesterol. Surprisingly, the interesterified fat had a similar, though weaker impact on cholesterol. "In this study we discovered that trans fat also has a weak negative influence on blood glucose. The newer replacement for trans, so-called interesterified fat, appears even worse in that regard, raising glucose 20 percent in a month," said Hayes. "This is the first human study to examine simultaneously the metabolic effects of the two most common replacement fats for a natural saturated fat widely incorporated in foods. As such, it is somewhat alarming that both modified fats failed to pass the sniff test for metabolic performance relative to palm olein itself," noted Sundram. "Whether this reflects the amount of test fat consumed, underlying genetics of the specific population examined, or some unknown factor, requires further study because the apparent adverse impact on insulin metabolism is a troubling finding," he added. Consumer advocate Mike Adams says more cases like this should be brought against the parents of children, not just pets. "Isn't it interesting that the courts are ruling it's illegal to make your dog obese, but it's perfectly okay to make your children obese by feeding them junk foods and sugary drinks?" Are we as a society really coming to this? The three leading trade associations in the processed food sector, the Grocery Manufacturers Association (GMA), the Food Products Association (FPA) [GMA and FPA are now one and the same]; and the Food Marketing Institute (FMI) have teamed up with MatchPoint Marketing to roll out Take a Peak in grocery stores across the US to convince us to eat according to the 2005 Dietary Recommendations for Americans and MyPyramid. This thinly veiled marketing ploy is being touted by the media as a program to help consumers; where "consumers will find aisle banners, kiosks and other displays in stores that will help point them to fare that is consistent with the dietary guidelines." As Sally Squires writes in the Washington Post, "The new displays will help put the government's message in front of shoppers as they roll their carts down grocery aisles." A quick review of MatchPoint Marketing's website page "about" tells us exactly what to expect, "If commerce is the engine that drives our economy, then MatchPoint Marketing is the spark. We ignite demand. We take consumers by the hand and lead them toawrd the ultimate goal - making the cash register ring." This isn't a small, trial-it-out campaign, it's well designed to completely overwhelm the senses - in stores you'll be innundated at every turn with aisle banners and signs, kiosks, tip cards, floor graphics, shelf signs pointing to products, manufacturer displays and even custom bags at the register check-out. Repeat the message often enough and it becomes truth; overwhelm the senses at it can happen at lightening speed. It may not need saying, but this year was wonderfully hectic here at Wilshire Central - we've enjoyed a visit from my parents, a visit from my inlaws, hosted our first big party in our new house, hosted another smaller get together this weekend, and are now getting ready for a much needed vacation! So, while I've only had time to post a couple of articles the last couple of weeks, you'll have to forgive my continued absence from the blogosphere until January 15th, when I'll be back from vacation and ready to settle back into life as we know it after the holidays. Derek A. Paice maintains a free e-book online, Diabetes & Diet (PDF), that details his experience controlling type 2 diabetes with diet. It's a fascinating read and chronicles his success in bringing his A1c from 9.0 in 1993 to 5.4 in 1997 to 5.2 in 2000. No matter what your opinion about carbohydrate restricted diets or glycemic index-load diets - this is worth reading to understand the value of testing, testing, testing and using that data to make adjustments to your diet based on how your body reacts to various foods - also known as eating to your meter! The People Magazine cover story this month is about people who lost weight; one woman, Mary Smith, lost 125-pounds using a low-carb diet (Atkins) as her weight loss approach. The People Magazine site also includes a video of all the individuals featured in the cover story. For some reason we love the idea of a paradox - the French Paradox, the Spanish Paradox and the Swiss Paradox are all ways we try to explain why some populations eat a diet so contrary to our dietary dogma, yet remain healthy and live longer than we. Discover Magazine has an article, The Inuit Paradox, that explores the traditional diet of the Inuit - and, like the other paradoxes, sets the stage that this society thrives despite their diet, rather than because of their diet; "Today, when diet books top the best-seller list and nobody seems sure of what to eat to stay healthy, it’s surprising to learn how well the Eskimo did on a high-protein, high-fat diet." Setting aside the assumptions the article makes, if you're interested in learning just how the Inuit eat (traditionally) this is a must read! While some may feel my position - that government regulation is not the solution to our obesity epidemic - take a gander at this article that highlights the scary ideas some have come up with to reverse the obesity epidemic! Gillian McKeith, an anti-obesity campaigner, had proposed, in addition to mandatory school lessons for children and tax breaks for the slim, that "nutritional hit squads" be deployed into private homes of obese people to clean out their pantry, cupboard and refridgerator to get them to eat healthy! Government ministers in Scotland rejected the idea. Dr. John Salerno has joined the ranks of bloggers with his new blog, The Salerno Strategy. He's a board-certified Family Practice physician who brings 15-years of experience in Family Medicine and Complementary Medicine to his blog. So....now I'm off for what I'm certain will be a great vacation and I hope you'll check back again on January 15th when I'll resume writing and posting here!